The first generation X-1 aircraft changed aviation history in numerous ways, and not simply because they were the first aircraft to fly faster than the speed of sound. Rather, they established the concept of the research aircraft, built solely for experimental purposes, and unhampered by any military or commercial requirements. Although subsequent X-planes were built for a wide range of purposes - technology or concept demonstrators, unmanned test missiles, and even as prototypes in all but name - the X-1s were built to go faster than an aircraft had ever flown before. The X-1 resulted from technological challenges facing aircraft designers in the late 1930s and early 1940s. Aircraft had begun to experience both subsonic and supersonic airflow over their wings. This created a range of undesirable characteristics - compressibility, increased drag, trim changes, severe turbulence, and loss of control effectiveness. Wind tunnels were affected by the same aerodynamic problems, and their data proved to be unreliable in this regime. As a result, a few individuals - John Stack of the NACA, Ezra Kotchner of the Army Air Forces, and Walter Diehl of the Navy - realized a specialized research aircraft offered the only feasible means of getting supersonic aeronautical data. The Army Air Forces selected Bell Aircraft to build three X-1 aircraft. The fuselage was the same shape as a 0.50 caliber machine gun bullet, which was known to be stable at supersonic speeds. The X-1 wings were straight, rather than swept back, and relatively thin for the time. The X-1-1 (serial number 46-062) had a wing with an 8 percent thickness/chord ratio. The X-1-2 (serial number 46-063) had a 10 percent ratio wing. The X-1 was powered by an XLR-11 rocket engine, which had four chambers and burned liquid oxygen (LOX) and a mixture of alcohol and water. In 1945, rockets were viewed with suspicion by some engineers. Both the NACA and Navy preferred a jet-powered research aircraft, rather than one using a rocket, as the Army Air Forces had selected. The X-1-1 was delivered by Bell in December 1945. At the same time, the Army Air Forces asked that NACA personnel oversee the instrumentation and data analysis of the X-1 flights. As a result, an NACA team was incorporated into the program. The first glide flight of the X-1 occurred on Jan. 19, 1946, at Pinecastle Field, Fla., by Bell test pilot Jack Woolams. The X-1-1 was air launched from a B-29. Woolams made a total of 10 glide flights to test the X-1's low-speed handing before it was returned to Bell in March 1946 for installation of the rocket engine. The aircraft was delivered to Muroc in October 1946. The first group of NACA engineers arrived at Muroc Field (now Edwards Air Force Base, Calif.), in September 1946 in preparation for the initial flights of the X-1-2. 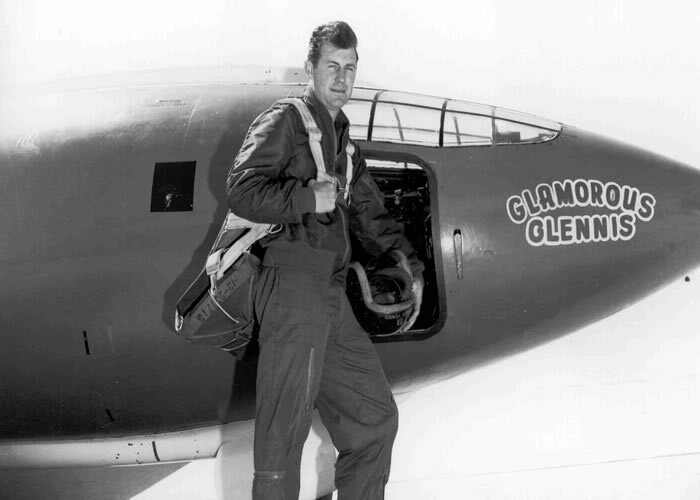 Bell test pilot Chalmers "Slick" Goodlin made the first glide flight in the X-1-2 on Oct. 11, 1946. After a total of four glide flights, he made the first powered flight on Dec. 9, reaching a speed of Mach 0.79. By June 1947, Bell had proven the airworthiness of both X-1s up to speeds of Mach 0.8. The contract freed the company from responsibility above this speed. 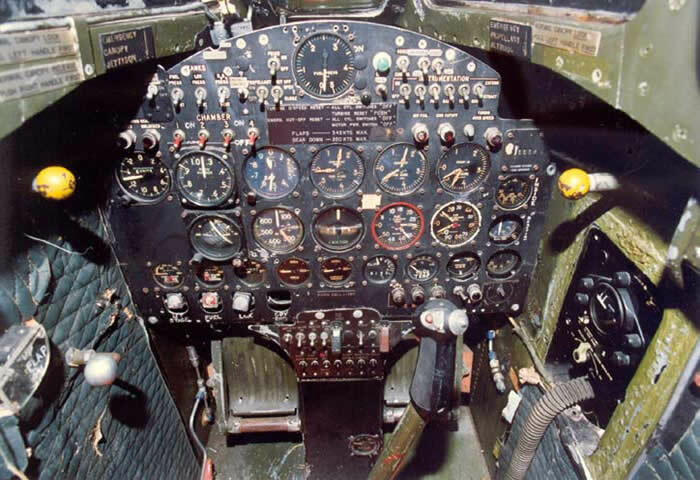 On June 30, 1947, Army Air Forces and NACA representatives agreed on a two-phase flight program. The Army Air Forces would use the X-1-1, with its thinner wing, to conduct an accelerated program to reach Mach 1.1 as quickly as possible. The NACA would provide support, such as technical advice and data analysis. The NACA would then undertake a slower-paced, more detailed series of research flights at transonic (near the speed of sound) speeds, using the X-1-2 and its thicker wing. Capt. 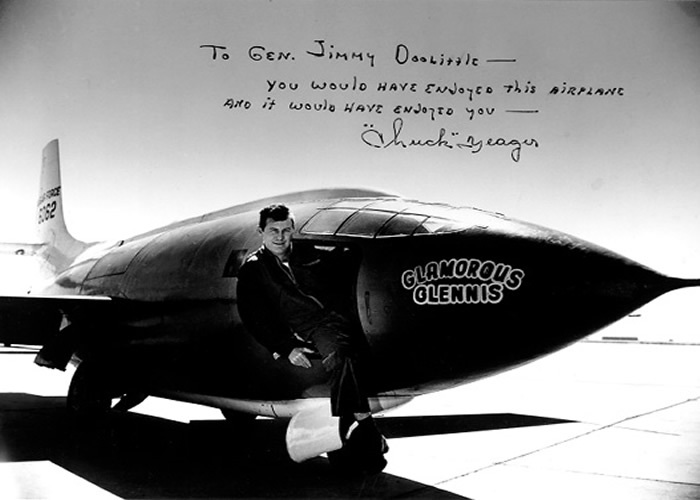 Charles E. "Chuck" Yeager was selected as the pilot for flights to Mach 1. He made his first glide flights on Aug. 6, 7, and 8, 1947. Yeager undertook his first powered flight in the X-1-1 on Aug. 29, reaching Mach 0.85. Over the next six weeks, Yeager came closer to Mach 1, reaching Mach 0.997 on Oct. 10. For the NACA engineers, used to a more cautious step-by-step approach, Yeager and the Air Force seemed to be acting in haste. Still, on Oct. 14, Yeager reached a speed of Mach 1.06 at 43,000 feet, becoming the first man to fly supersonic. Air Force officials designated the flight and all data as Top Secret two hours later. Not until December 1947 would word leak of the achievement, and it was not until March 1948 that the U.S. Air Force officially confirmed the achievement. 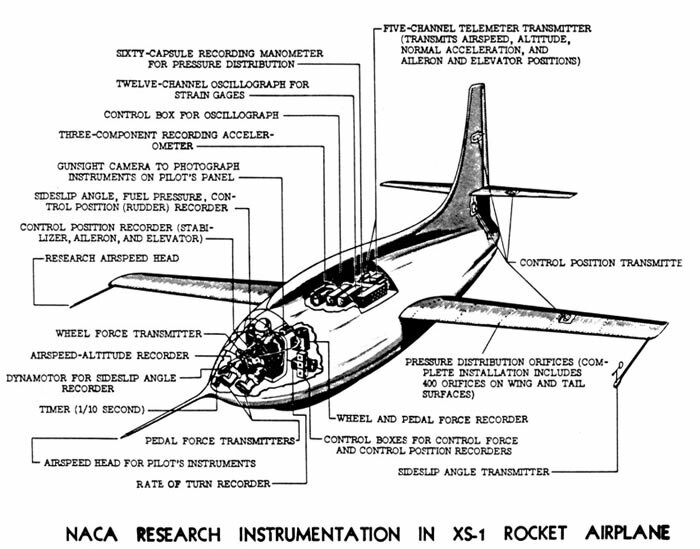 The NACA now began flying the X-1-2 on research missions. On Oct. 21, 1947, NACA pilot Herbert H. Hoover made a glide flight. Hoover followed this mission on Dec. 16 with a powered flight to Mach 0.84. In January 1948, a second NACA research pilot, Howard C. Lilly, joined the program. The initial NACA flights in the aircraft sought data on turns and pull ups, side slips, and elevator effectiveness at subsonic speeds. It was not until March 4, 1948, that Hoover reached Mach 1.029. Hoover became the second man to reach Mach 1, on the first NACA and the first civilian supersonic flight. Lilly flew at Mach 1.1 on March 31. Robert A. Champine replaced Hoover and Lilly on the X-1 program in November 1948, undertaking studies of wing pressure distribution, stability and control, and stabilizer effectiveness. John H. Griffith continued these research efforts when he replaced Champine on the X-1 program. Griffith flew the X-1-2 through October 1950, when he left the NACA for a job as a company test pilot. A. Scott Crossfield joined the research efforts in April 1951, adding Joe Walker in August. The research usefulness of the first generation X-1 aircraft was nearing an end. The second generation X-1 aircraft, then under development, would be able to reach twice the speed of sound. After Yeager's Mach 1 flight, the X-1-1 had been used by the Air Force to acquire data on stability and control, wing and tail loading, high-altitude flight, and pilot familiarization. After a final flight by Yeager on May 12, 1950, the X-1-1 was retired and given to the Smithsonian Institution. The X-1-2 continued flying, but technical problems brought its work to a close. The X-1-1 and X-1-2 both used a fuel system pressurized with nitrogen. The X-1-2's nitrogen tanks were nearing the end of their fatigue life, risking a possible explosion. Consequently, NACA officials grounded the X-1-2, which later returned in a much modified state as the X-1E. The X-1-3 (serial number 46-064) represented the final example of first generation X-1 series. The X-1-3 was externally identical to the other two aircraft. The fuel system in the X-1-3 did not rely on nitrogen pressure, however, but rather on a turbopump. This eliminated the need for the heavy nitrogen tanks, and resulted in a calculated maximum speed of Mach 2.4, a full Mach number higher than the X-1-1 or X-1-2 could reach. Funding cuts and turbopump development problems, however, delayed the aircraft a full three years. The Air Force had also contracted with Bell Aircraft to develop the second generation X-1A, X-1B, and X-1D. Interest in the X-1-3 faded, and the Air Force cancelled it. The NACA, wanting its own Mach 2 aircraft to experiment with, picked up the Air Force's canceled X-1-3. The X-1-3 was delivered to Edwards in April 1951. Bell test pilot Joseph Cannon successfully made a glide flight in the aircraft on July 20. 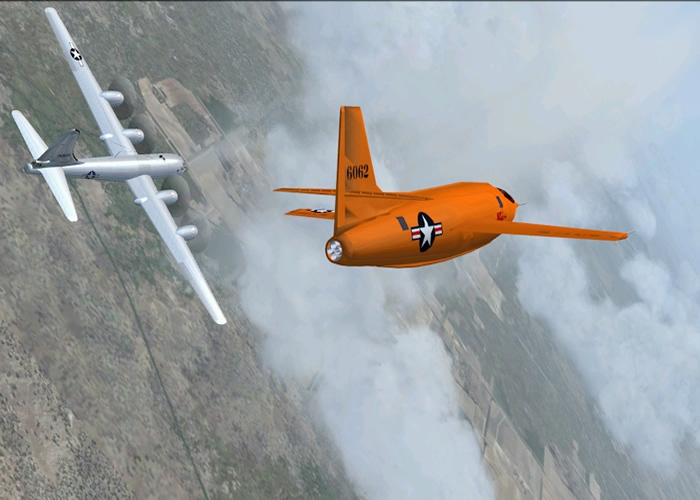 On Nov. 9, 1951, a captive flight was made by the X-1-3 aboard the B-50 launch aircraft. This was to be a rehearsal for the first powered flight, as well as a test of the jettisoning system. Engineers cancelled the jettisoning tests, however, when nitrogen pressure fell. The B-50 with the fully fueled X-1-3 still attached landed back at Edwards safely, and preparations began to jettison the LOX. As Cannon pressurized the LOX tank, however, a dull thud was heard, followed by a hiss and a small cloud of white vapor escaped from the X-1-3's center section. Then, a violent explosion occurred, with yellow flames and black smoke engulfing both the X-1-3 and the B-50. Cannon escaped from the X-1-3, but spent nearly a year in the hospital recovering from severe burns on his legs, arms and body. The fire and subsequent explosions destroyed both the X-1-3 and B-50.